I'm trying something new in one of the small rooms in our home. 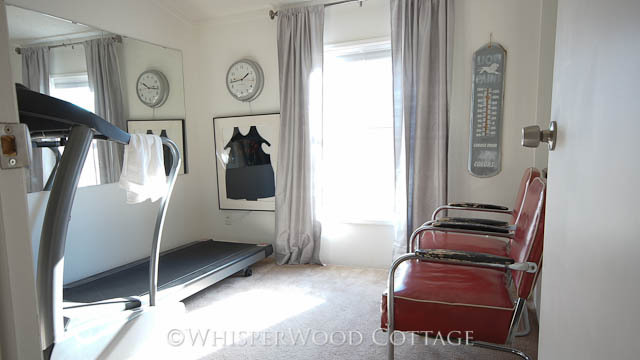 This space was used as a workout room for the past several years. using only things I had on hand. For the bed, I am simply using an inflatable mattress and one of those portable mattress frames. I pulled in the two vintage medical cabinets. 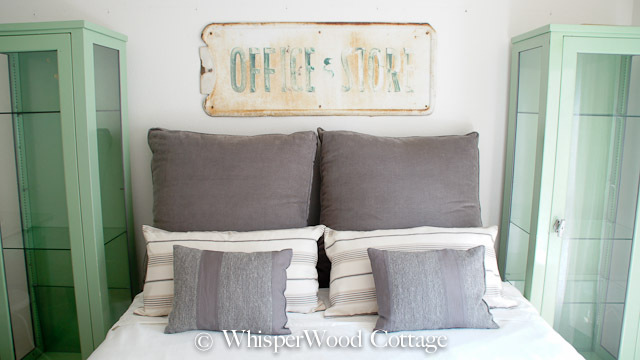 The vintage metal hand-painted "office & store" sign seemed to belong at home above the bed. Then I added bedding and pillows from the linen closet and around the house. I replaced the grey silk drapes with sheers. 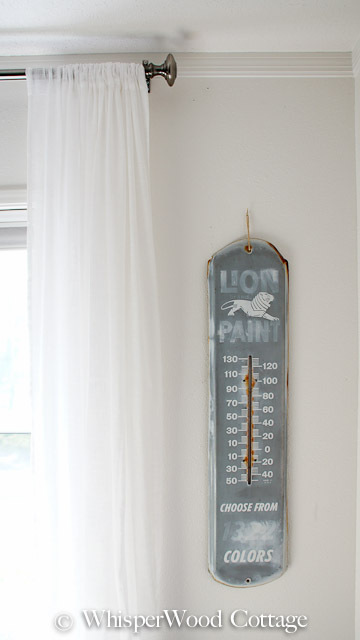 The vintage Lion Pain wall thermometer stayed right where it was. I'll have to see how it works over a period of time. The room is pretty small, so any purpose for this room seems to be a challenge. The jury is still out on this space! Do you have any small spaces that are a challenge for you? How do you use those small rooms? Any tips or suggestions on making small spaces work? I haven't been blogging all summer and I come by today and what do I see? My two favorite pieces of yours, those medical cabinets! I do love them! And they look great in the room you put together with all the stuff you already had. Genius! Your new room looks fabulous!!! It looks great...no wasted space and will function perfectly! 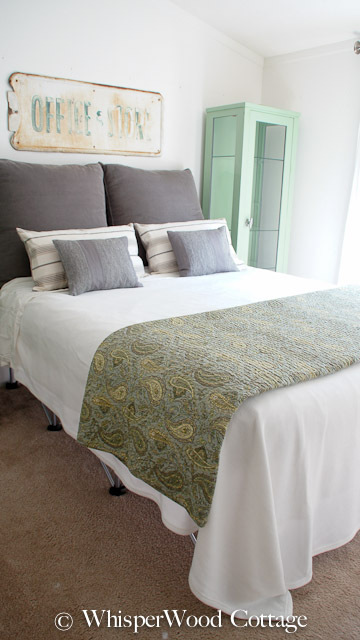 Guests just want to plop their head in an uncluttered room and fresh linens right? Maybe add a bed skirt to hide the legs that are peaking through..add a few knickknacks in the shelf and DONE! We have a couple small space rooms, one in particular that has given me a headache since moving in. When we tried to figure out what to do with the space we thought about what we needed most and that was storage or even just a big closet. So, that space turned into my closet/dressing room. I'm still working on it, but now I really love and appreciate the space. I let my hubby take over our itty-bitty his and hers closets and I have closet heaven- which used to be a useless space. I say- figure out what you need or wish you had and see if you can make that small space work for one of those needs! My whole house is a small space so I'm always feeling challenged in this area, especially as I continually bring more things home. You have some incredible pieces in this room! I love this room....I truly love those fantastic cabinets and warm and soothing color scheme....great idea with using the inflatable mattress and frame...You did a great job with the space allowed to you...I love that there are so many interesting pieces...true focal points!